So what is a Health Halo anyway? The answer is simple... it is basically any food with a perceived health benefit. For example, there are so many foods today that are touted as being organic, natural, gluten-free, or non-GMO. Just because they are marketed with those claims does not mean that these foods with a health halo are fabulous for our energy levels or waistlines. Bacon is “natural”, but I think most would agree that it is not great for us. So what is a savvy New Yorker to do when trying to choose food with halos, but wanting to do it the “right” way? Follow my easy tips below and you will be on your way to choosing tasty foods that you can feel good about. 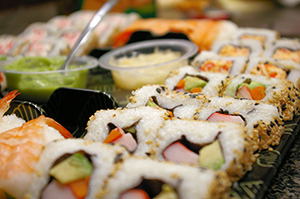 SUSHI can be one of the best choices when dining out or ordering takeout in New York. It is typically made with fresh ingredients that are not pre-prepared and are made at the time you order. However if you are not careful, your meal can quickly add up in unwanted calories in fat. • Choose simple ingredients such as fish, rice, avocado, cucumber and other veggies for your maki style and hand rolls. • To decrease the amount of carbohydrates and calories in your rolls, ask them to make it using less rice or order “Naruto” rolls, which are rolled in cucumber instead of rice. • Spicy rolls are typically made with mayonnaise. To enjoy the flavor without the extra fat, simply order the spicy mayo on the side and then dab a bit on top of each piece of your roll. You’ll get the same flavor without the extra fat.Order Chirashi as your meal. It’s a great option and is on most menus. In this dish, sashimi is served on a bed of rice and you can decide how much rice to eat with each bite. • Great appetizer choices include edamame, garden salad and miso soups. 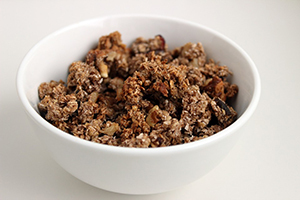 GRANOLA is one of those foods that many people love for breakfast or reach for as a convenient snack. If you don’t check labels you could be turning this into a dessert. • Simplicity is key. Look at ingredients and choose brands that list items that you recognize and can pronounce. The least processed, the better. • Keep portions in mind. You’ll notice on the Nutrition Facts label that most servings are 1/4 - 1/3 cup and range from approximately 120-150 calories per serving. If you pour yourself a 1 Cup bowl that can add up to almost 400 calories or more! • If you enjoy granola as a cereal with milk, use 1 serving and mix with a fiber rich cereal and berries to bulk up your bowl. • Granola can be a great topping for Greek yogurt with fruit. 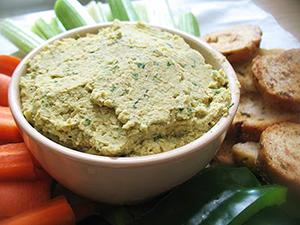 HUMMUS AND GUACAMOLE are two of my personal favorites for taste and they are a great source of “healthy fats”. Portion control is the key here otherwise the calories and fat skyrocket before you know it. • 2-4 Tablespoons should be your portion guideline (2 tablespoons if you are watching your weight). • Make a little go a long way. Put a portion on your plate and use as your dip. • Spread as a condiment on your favorite sandwich instead of mayo, oil or mustard. • Instead of traditional salad dressing, use 2-4 Tablespoons of hummus or guacamole. • For a quick meal idea, simply dollop either (or both) on top of simply grilled chicken or fish and serve with a side of roasted veggies. 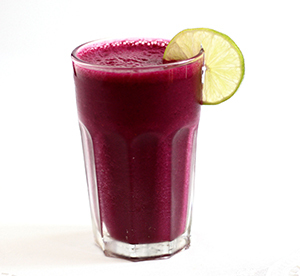 JUICES & SMOOTHIES are a quick and convenient option and are available at so many local shops. They can be nutritious and delicious but be careful of pitfalls that will take a vitamin-rich option to a sugar-rich choice. • All types of juices typically lack fiber, which is extracted in the juicing process. Fiber is an important part of weight control and slows the absorption of sugar found in the juice itself. • If you do enjoy a juice for the benefits of the vitamins, minerals, antioxidants and phytochemicals, go for green juices made from leafy greens and veggies. These tend to have less sugar than their fruit juice counterparts. In fact, a typical bottle will run you about 80-150 calories in comparison to a fruit juice with 150-250 calories. • A smoothie with the right ingredients is a better option while keeping the fiber. Choose those made primarily from vegetables with 1 serving of fruit. Those made with 3-4 fruit servings or more still will add up in sugar and calories. • Choose a smoothie with a quality protein choice such as Greek yogurt or milk. A tablespoon of your favorite nut butter will add a burst of flavor and a scoop of cacao powder will give it a chocolate punch. • Try making a refreshing smoothie at home in your blender using this easy guideline: 1 cup plain Greek yogurt + 1 cup frozen berries + 1 tablespoon nut butter + handful of spinach + ¼ cup water. FROZEN YOGURT is one of those yummy foods that so many of us want to believe has the same health benefits as a serving of yogurt but in a frozen format. Unfortunately, that just isn’t so. Although some may have the benefit of probiotics, most are made with extra sugar and other additives for flavor and texture. Keep in mind that flavors can range between 25-30 calories per ounce. This does not seem like much but when you are filling your cup at your local self-serve shop, you can easily be pumping 6-8 ounces... that can be as low as 150 calories but as high as 240 calories before you even add toppings (and it is usually a dessert after you’ve eaten a full meal)! • Count while serving yourself. Typically each second is about a 1 ounce. Count to 3 or 4... 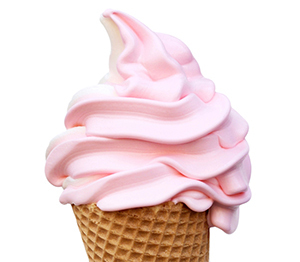 If you are enjoying as a snack you want between 100-200 calories total, including the fro yo and toppings. • Weigh your cup before putting toppings on so you can calculate the calories. You can always add more. • Start with a cup of fruit and top with 1-3 ounces of frozen yogurt as the topping and not the other way around. • Make a fruit sundae instead of using frozen yogurt at all. Mix a generous cup of berries and top with a tablespoon of chocolate syrup, a few mini marshmallows and chopped walnuts or sliced almonds.